Photonix Scientific Corporation is one of the reliable Vacuum Rotary Evaporator Manufacturers and Suppliers. The company has been serving its clients with Vacuum Rotary Evaporators in the international markets too. Laboratory Vacuum Rotary Evaporator is used in laboratories for the purpose of removing solvents by the process of evaporation. Mainly the samples of solvents are removed by this process. Photonix Scientific Corporation is an ace manufacturer, exporter, importer and supplier of scientific products. 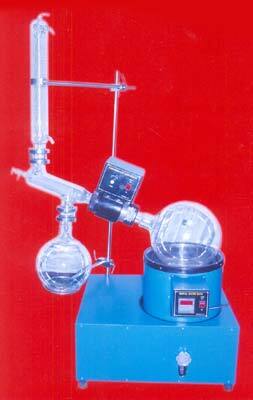 The main components of a rotary evaporator are also manufactured, exported, imported and supplied by us.